This week the Art Department have chosen to feature these bird sculptures by the year 7 group. Their project was inspired by illustrator Eric Carle who is most famous for The Very Hungry Caterpillar. To make their birds the year 7 pupils first carved 3D bird shapes from floristry oasis. They then coated the form in PVA glue to seal it. 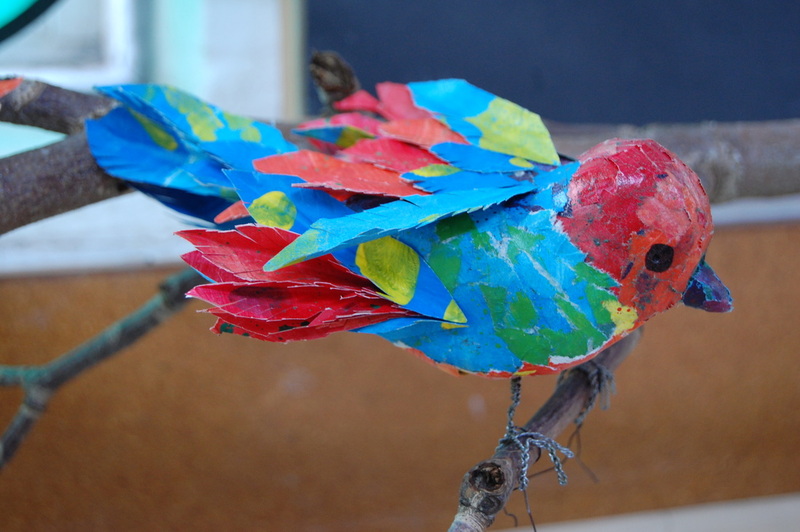 Eric Carle’s art work is created using a collage technique, which the pupils have replicated, using hand-painted papers, cut and layered all over the bird to form these bright and colourful creations. Finishing touches of feathers and beaks were added, also formed from the hand coloured papers. Lastly the legs were sculpted from wire. The year 7s chose this big branch to display the birds on, some perched on twigs and others taking flight, and with left over paper made a nest, complete with eggs! The artwork is currently on display outside the recital room, to accompany the Birdsong piece which will be performed at the First-Study Composers’ Concert this evening.